Ilona Jánky or Ilona Jánky Práda to give her the full name presented by Swedish company Nosag in their brief biographical notes was born to a Hungarian family in Transylvania. She studied in Cluj (maybe better known as Klausenburg), entered the 1961 Enescu Piano Competition "with good results" but was subsequently hampered by prevailing conditions in her country and didn�t follow the path of a concert soloist. Instead she taught � she�s a well-known pedagogue in her own country - and formed chamber partnerships. Newly active again after a brain haemorrhage in 1999 she has begun to make records for Nosag. This one is a compilation of privately recorded material made over the period from 1965 to 1982 but the majority come from the years between 1977 and 1982; the Bach is the oldest; the Prokofiev was taped in 1972. One has to accept that these recordings are relatively crude documents; there�s tape hiss and sometimes a big echo (Chopin�s Ballade in F). In concert in what sounds a small recital hall or a large reception room the acoustic is very ad hoc and the piano doesn�t always sound well. Nevertheless these are private recordings, otherwise undocumented, and represent resilience and dedication on the part of pianist and company alike. Given these drawbacks it�s difficult to know to what extent these recordings reflect her musicianship though they must bear her imprimatur given that the recordings derive from her. Her Chopin is rather uneven. The Ballade in F sees her rushing her bars and at the mercy of a temperamental technique; in all honesty this sounds like a practice session given the number of mistakes and slips. The other Chopin items are considerably better but the Sonata isn�t really persuasive; frequently competent but rhythmically sometimes flustered and lacking a certain amount of feeling. The Bach, the 1965 recording, is quite adequate though sometimes devitalised in the last movement; the Brahms peremptory and aggressive, with conflicting voicings and relatively faceless in the lyric moments. The Prokofiev is better, though, as the booklet points out, there was some deterioration in the tape and little gaps remain � clearly it was a work with which she had some real sympathy. Schumann�s First Sonata is rather inert; certainly the vividly etched drama of a Gieseking is missing, though the recording certainly hinders by smoothing out dynamic contrasts. 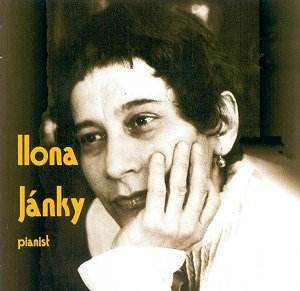 This is a feeling tribute to Ilona Jánky Práda who has clearly been a force for musical good in her native country.